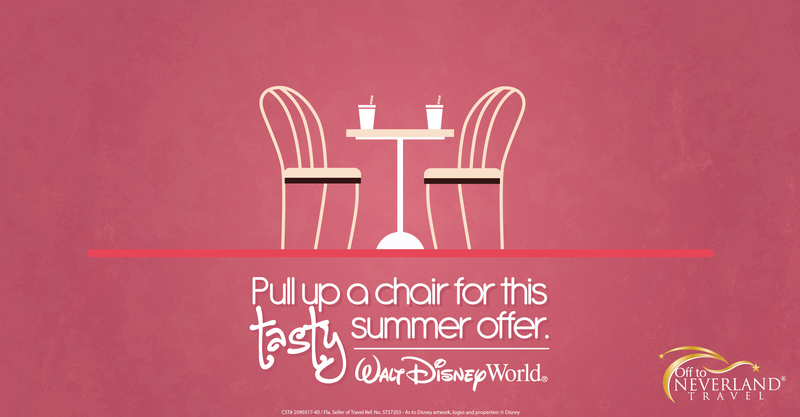 Gather ’round the table for the tastiest vacation offer available at the Walt Disney World® Resort! Disney FREE Dining 2019 is back exclusively for Disney® Visa® Cardmembers! Availability on this offer is limited, so don’t delay! Now through Jun. 16, 2019, Disney® Visa® Cardmembers purchasing a non-discounted Disney Resort Hotel package including a minimum 4-night stay with 4-day or longer Park Hopper® or Park Hopper® Plus Option tickets at participating Disney Value or Moderate Resorts and get the Disney Quick-Service Dining Plan for FREE. Or, buy a non-discounted Disney Resort Hotel package including a minimum 4-night stay with 4-day or longer Park Hopper® or Park Hopper® Plus Option tickets at participating Disney Deluxe or Deluxe Villa Resorts and get the Disney Dining Plan for FREE. Upgrades to a different dining plan are available at an additional cost. Some of the best family memories are made during a family dinner! Contact your Magic Maker® Travel Professional today for your taste of these scrumptious savings! To qualify for the Disney® Visa® Cardmembers FREE Dining 2019 promotion, a minimum stay of 4-nights and 4-day Base Ticket with Park Hopper® or Park Hopper® Plus option is required. The number of rooms allocated for this offer is limited. Advance reservation required. Theme park tickets valid for admission beginning on date of check-in and must be used within a limited number of days, depending on length of stay and ticket. Visit disneydestinationstickets.com/usage for more details. Children ages 3 to 9 must choose from the children’s menu, if available. Gratuities are not included. Cannot be combined with any other discount or promotion. Everyone in the same room must be on the same package. Offer excludes the following room types: 3-bedroom villas, campsites, Cabins at Copper Creek villas & Cabins at Disney’s Wilderness Lodge, Bungalows at Polynesian Villas & Bungalows, and The Little Mermaid standard rooms at Disney’s Art of Animation Resort. Because Advance Dining Reservations (ADR) open 180 days in advance, some table service restaurants may have limited or no availability at the time of booking. No group rates or other discounts apply. Offers cannot be combined and are nontransferable. Advance reservations required. Disney® Visa® FREE Dining 2019 offer is subject to change without notice. 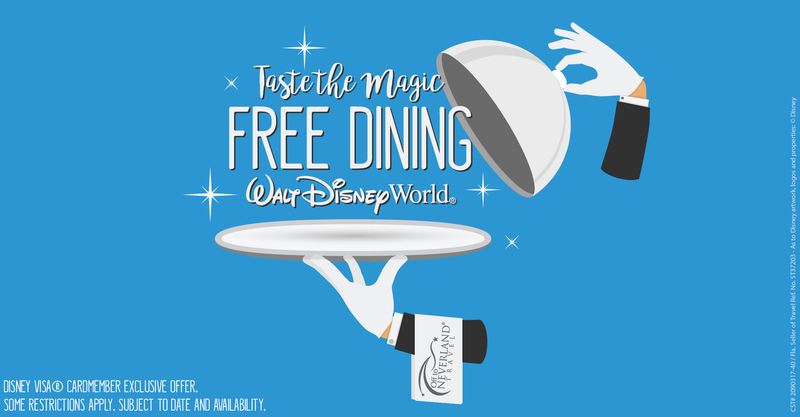 Get a FREE Quick-Service meal per person, per night with the purchase of select Disney Resort Hotel Packages! Summer 2019 is a tasty time to discover all-new experiences and have the vacation of your dreams at the Walt Disney World® Resort! Availability on this special offer is limited, so don’t delay! Now through Jun. 30, 2019, purchase a non-discounted Disney Resort Hotel package including a minimum 3-night stay and theme park tickets at participating Disney Value or Moderate Resorts and get one FREE Quick-Service Meal per person per night. Upgrades to the traditional Quick-Service Dining Plan or Plus Disney Dining Plan are available at an additional cost! Ask your Magic Maker® which dining plan may be best for your family. Contact your Magic Maker® today for your taste of these scrumptious savings! The number of rooms allocated for this offer is limited. Everyone in the same room must be on the same package. Advance reservations are required. Theme park tickets valid for admission beginning on date of check-in and must be used within a limited number of days, depending on length of stay and ticket. Visit disneydestinationstickets.com/usage for more details. Each quick-service meal includes one entrée and one non-alcoholic beverage (or, if age 21 or over, one beer, wine or cocktail). Cannot be combined with any other discount or promotion. 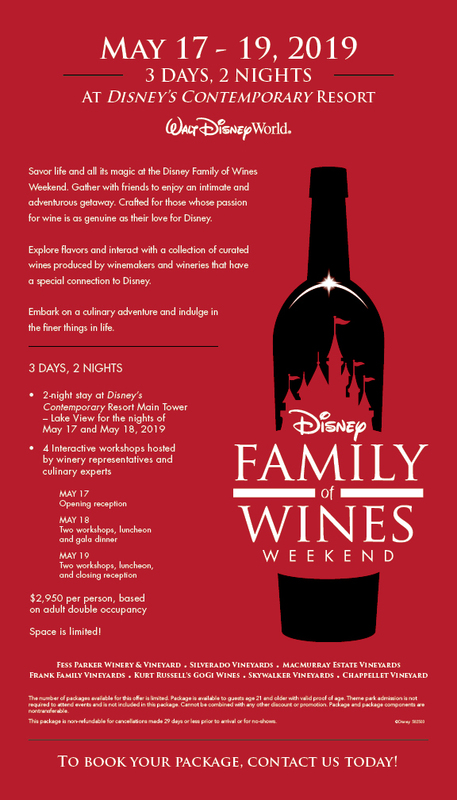 Offer excludes Disney’s Port Orleans Resort – French Quarter, Disney’s All-Star Movies Resort and The Little Mermaid Standard Rooms at Disney’s Art of Animation Resort. Children ages 3 to 9 must choose from the children’s menu, if available. Most beer, wine and cocktails included. Some exceptions apply. Must present valid ID to be served alcoholic beverages. May only be redeemed with the quick-service meal. Gratuities are not included. New family memories are waiting to be made at “The Most Magical Place on Earth” in 2019! You’ll enjoy a magical mix of new and unforgettable experiences – from “playing big” in the new Toy Story Land at Disney’s Hollywood Studios® to celebrating the 25th anniversary of The Lion King inside Disney’s Animal Kingdom® Theme Park and soaking up a variety of new, limited-time experiences at Magic Kingdom® park, your upcoming trip is a dream come true for kids ‘n’ grown-ups alike! 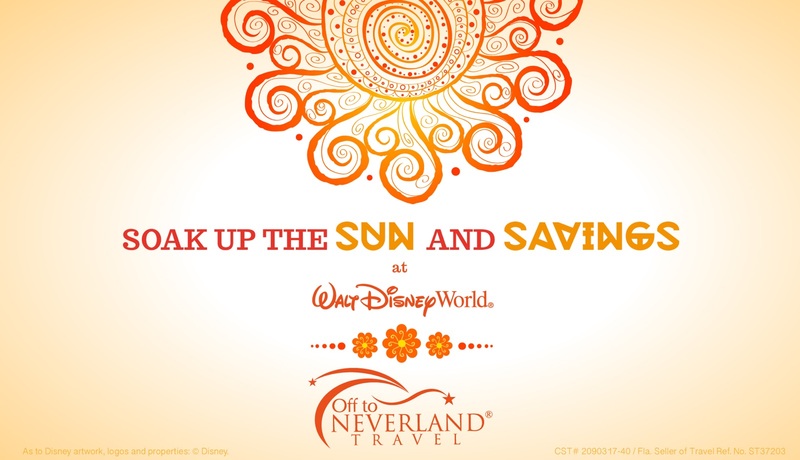 For a limited time, you can save up to 25% at select Walt Disney World® Resort hotels for stays most nights Apr. 28 through May 27, 2019. Not only will you enjoy staying closer to the magic, your stay will also include an array of special Disney touches and magical extras that only on-property guests receive! 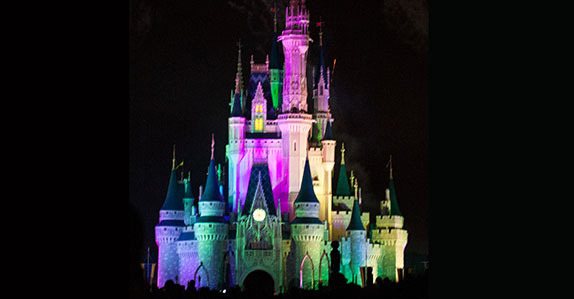 For a limited time, you can save up to 25% at select Walt Disney World® Resort hotels for stays most nights May 28 through Aug. 28, 2019. As a bonus, arrivals May 28 to Jun. 30, 2019 will receive a Disney Gift Card at check-in! The value of the Disney Gift Card will vary based on Resort Category and original length of stay: Disney Deluxe Villa Resorts: $25 per room per night; Disney Deluxe Resorts: $20 per room per night; Disney Moderate Resorts: $15 per room per night; and Disney Value Resorts: $10 per room per night. 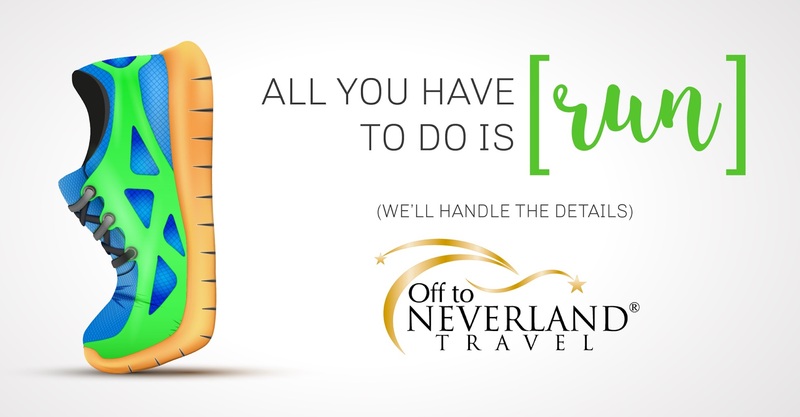 Contact your Magic Maker® Travel Professional today for pricing and availability! Book early for best availability and pricing! The number of rooms allocated for this offer is limited. Length of stay requirements may apply. Savings based on the non-discounted price for the same room. Additional per-adult charges may apply if more than two adults per room at Disney Value, Moderate and Deluxe Resorts and Studios at Disney Deluxe Villa Resorts. Advance reservations required. Cannot be combined with any other discount or promotion. Offer excludes the following room types: 3-bedroom villas, Cabins at Copper Creek Villas & Cabins at Disney’s Wilderness Lodge, the Campsites at Disney’s Fort Wilderness Resort and Bungalows at Disney’s Polynesian Villas & Bungalows. Important Details About Reservations Qualifying for the Disney Gift Card: One Disney Gift Card per reservation. If you complete online check-in in advance, the digital Disney Gift Card will be emailed to you on the day of your arrival. Otherwise, you’ll be asked for your email address when you check in at the Front Desk of your Disney Resort hotel—and the digital Disney Gift Card will be sent to that email address. The email will contain a bar code for using the digital Disney Gift Card, and the usage locations will be listed in the disclaimer. If you don’t receive your Disney Gift Card in your inbox, please check your spam folder or stop by the Front Desk for assistance. Disney Gift Card is usable only to buy goods and services at participating locations including the Disneyland Resort; Walt Disney World Resort; Disney Cruise Line; Disney store locations in the US, Canada and Puerto Rico; and shopDisney.com. Not refundable or redeemable for cash unless required by law. Not redeemable to purchase another gift card or towards previously purchased goods or services. Not a credit or debit card. Does not expire and no fees apply. Lost, stolen, or damaged gift cards cannot be replaced without required proof of purchase and complete gift card number. Disney Gift Card Services, Inc. (“DGCS”) is the card issuer and sole obligor to cardholder and is not responsible for any unauthorized use of card. Card is valid only if obtained at select Disney locations in the US, Canada or Puerto Rico or authorized third-party distributors. Card is not valid and will not be honored if obtained from unauthorized sellers or resellers, including through Internet auction sites. For balance inquiry, participating locations, and additional terms and conditions (including arbitration agreement) for this gift card, visit DisneyGiftCard.com or call (877) 650-4327. DGCS reserves the right to change the terms and conditions of the gift card upon notice at DisneyGiftCard.com. Purchase, use or acceptance of card constitutes acceptance of these terms. 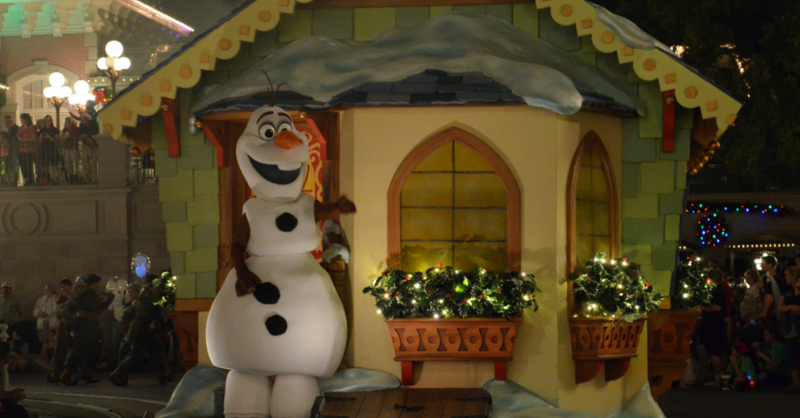 Magic Kingdom® Park has announced dates for this year’s Mickey’s Very Merry Christmas Party! While full details of the specially-ticketed party have not been released, we do know that “Mickey’s Once Upon a Christmastime Parade,” “A Frozen Holiday Wish,” and “Mickey’s Most Merriest Celebration” are scheduled to return! Pricing varies by date, but start at $99 in advance or $109 at the gate, if available, plus tax. Contact your Magic Maker® today to secure your tickets as some dates will sell out! Walt Disney World® Resort has announced the extension of events giving guests after-hours access to some of the resort’s favorite attractions and character experiences. On select nights, Magic Kingdom®, Disney’s Hollywood Studios® and Disney’s Animal Kingdom® Theme Parks will remain open 3 extra hours for those with special event tickets for Disney After Hours. Admission, which begins early at 7p, includes select attractions and character meet & greets as well as food and beverage offerings like ice cream novelties, popcorn, and select bottled beverages. A limited number of tickets will be sold for each night of the event. *All attractions and entertainment are subject to change without notice. More than 20 popular Magic Kingdom® attractions with surprising, villain-inspired additions at Pirates of the Caribbean® and Space Mountain®. Villains Unite the Night, an all-new stage show featuring Hades, Jafar, Dr. Facilier and more at Cinderella Castle. Maleficent Dragon parade float will make its way through the park several times—breathing fire at night for the first time ever! Loathsome lighting and malevolent music throughout the park. Special villains-themed food and beverage offerings available for purchase at the event. NOTE: Character Greetings are NOT part of the event. On this day, we celebrate three decades worth of movie magic and super heroic action. Meet some of your favorite Disney and Disney•Pixar pals throughout the park for special photo ops. Then, be sure to bring home a piece of history when you purchase 30th Anniversary souvenirs. Star Wars fans of all ages won’t want to miss this stellar night. Don your best cosplay and blast off to Star Wars Launch Bay where you’ll encounter Chewbacca with Rey, Kylo Ren with Captain Phasma, and more! As you explore the park you may even meet some friendly ewoks—but beware—you could also find those loyal to the dark side. Themed merchandise and tasty treats will also be available. Costume guidelines apply. 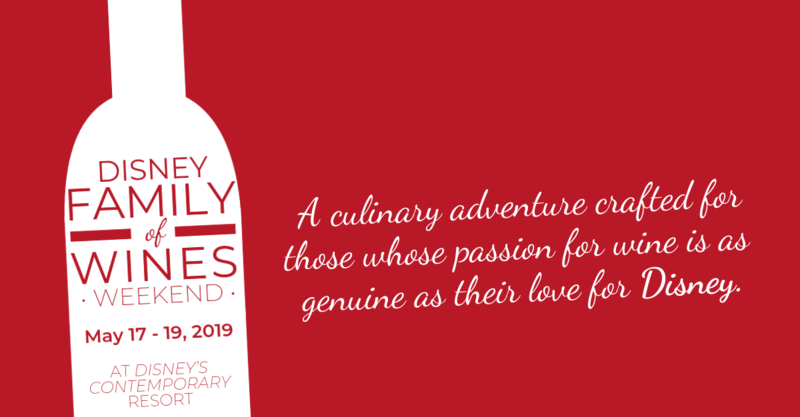 A limited number of tickets are available for each event night! Contact your Magic Maker® for more details and to secure your tickets! Parks will officially close to Guests who haven’t purchased Disney After Hours tickets. Number of tickets available is limited. All tickets are non-refundable, non-transferrable and are only valid for admission during the special event date and hours. All attractions, entertainment and experiences are subject to change without notice. Year after year, runDisney continues to be the premier destination race series that delivers magical moments to last a lifetime. First time runners and experienced endurance athletes alike enjoy spectacular runs through Disney theme parks on some of the most magical courses on Earth! With 4 themed weekends that take place at Walt Disney World® Resort in Florida (races at the Disneyland® Resort in California have been temporarily suspended), there’s a race experience that’s perfect for each member of your family! Marathon or half marathon races headline each runDisney weekend, but other offerings include 10Ks, 5Ks, Kids Races and a runDisney Health & Fitness Expo. And of course, each race has it’s own bling! The more races you complete, the more coveted finisher medals you’ll earn! There are also challenge medal that are awarded to runners who complete more than one race during a race weekend! Don’t miss out on the fun! And now for a limited time, you can book your stay and secure your Race Registration (bib) for three upcoming events before they go on sale to the general public! All the benefits of staying at Disney Resort hotel like early access to FastPass+ planning, Extra Magic Hours, and more! Hurry! This offer expires Apr. 14, 2019! Contact your Magic Maker® today! Availability is limited! Back in August of 2015, Disney Chairman and CEO Bob Iger announced that a brand-new, 14-acre Star Wars-themed land was coming to Disneyland® Park in Southern California and Disney’s Hollywood Studios® in Florida. Since then, anticipation has reached galactic proportions as construction and details of the largest single-themed land expansion at both parks has progressed. Let’s take a look at what we know so far about Star Wars: Galaxy’s Edge. We’ll keep the page updated as more details emerge. We’ll start off with the big detail that everyone wants to know. Star Wars: Galaxy’s Edge will be opening in two phases at each park. Phase one will include the debut of the Millennium Falcon: Smugglers Run attraction as well as select food & beverage and merchandise locations. Phase one opening will take place on May 31, 2019 at Disneyland® Park in California and on Aug. 29, 2019 at Disney’s Hollywood Studios® at Walt Disney World® Resort in Florida. Phase two opening will take place later in 2019 and will debut the rest of the land and the attraction Star Wars: Rise of the Resistance. When you visit Star Wars: Galaxy’s Edge, you’ll be transported to the Planet of Batuu, a far-flung destination along the galaxy’s Outer Rim. Batuu is home to Black Spire Outpost, an infamous port for smugglers, traders and adventurers. Millennium Falcon: Smugglers Run – climb into the cockpit of “the fastest hunk of junk in the galaxy” and take control of the Falcon as you assume one of three unique and critical roles of the ship – pilot, gunner, or flight engineer. Both thrilling and interactive, the smuggling mission kicks off on May 31, 2019 at Disneyland® Park and on Aug. 29, 2019 at Disney’s Hollywood Studios®. Guests must be 38″ (97 cm) or taller. Star Wars: Rise of the Resistance – places you in the middle of an epic battle between the Resistance and the First Order. The fight against the First Order is just part of your journey inside a full-size starship and aboard a nearby Star Destroyer. Your chance to join the Resistance will come later in 2019! Guests must be 40″ (102 cm) or taller. For more than four decades, we’ve all been wondering what does Blue Milk actually taste like? That question and more will soon be answered thanks to an expansive array of food and beverage offerings that will be available at Star Wars: Galaxy’s Edge. Kat Saka’s Kettle – home of the Outpost mix, a unique popcorn snack with a combination of sweet, savory and spicy flavors. Oga’s Cantina – visitors of all ages will enjoy exotic beverages served in unique vessels while listening to spirited musical entertainment provided by the cantina’s DJ R-3X, otherwise known as Rex. You may remember Rex as the former Starspeeder 3000 pilot droid from the original Star Tours attraction. Rumor is that he’s as quirky and talkative as ever! Docking Bay 7 Food and Cargo – is a designated location for traveling food shuttles on Batuu and the place to head to fuel up galactic favorites. Chef Strono “Cookie” Tuggs is in much demand for his culinary skills, so his travels across the galaxy in a mobile kitchen allow him to fill his pantry with exotic ingredients used to make new and unusual dishes. Ronto Roasters – this location’s large recycled podracing engine fires up a barbecue pit for mouth-watering exotic meats. In addition to the tasty Ronto fare, a variety of exotic non-alcoholic drinks like the Sour Sarlacc or Tatooine Sunset will be available. Milk Stand – will offer two favorites of the locals direct from Bubo Wamba Family Farms – Blue Milk (as seen in “Star Wars: Episode IV – A New Hope”) and Green Milk (as seen in“Star Wars: Episode VIII – The Last Jedi.”). Be on the lookout for specially designed Coca-Cola bottles that are being made specifically for and are only available for purchase on Batuu. Reservations will not be accepted for any of the food and beverage offerings in Star Wars: Galaxy’s Edge. Food is just one of discoveries you’ll find while wandering the lively market of Black Spire Outpost. You’ll also find a robust collection of merchant shops and stalls filled with authentic Star Wars creations. Droid Depot – step into Mubo’s workshop and construct your own astromech droid to take back with you to your home planet. Picking pieces and parts off of a conveyor belt, you’ll build one of two core models (R-series or BB-series) that will interact with various elements throughout Batuu. Further customize your droid by adding additional programming chips. The Droid Depot will also offer pre-built droids, droid-inspired products and more. Savi’s Workshop ~ Handbuilt Lightsabers – customize and craft your very own lightsaber with some help from the Gatherers. These workshop Masters not only guide you in building your unique lightsaber, but they’ll also instruct you on the ways of the Jedi. Dok-Ondar’s Den of Antiquities – find a selection of rare and uniquely-valued items for sale representing different eras of the Star Wars galaxy. First Order Cargo – step into a temporary First Order storage dock and pledge your loyalty by purchasing pins, caps, gear, model ships and more. Resistance Supply – manned by Resistance members and local sympathizers, this makeshift stall supplies Resistance uniforms, pins, badges, hats, helmets, jackets, maps, tools, training supplies, food rations and other items. Star Wars: Galaxy’s Edge is the first land within a Disney park designed to integrate with the Play Disney Parks mobile app, which debuted last year. When you use the app inside the land, it will provide new opportunities for you to engage such as translating a galactic language, learning what’s hidden inside crates and containers, or accomplishing certain tasks by participating in missions. You can also use the Play Disney Parks app to interact with a variety of elements such as droids, ships, media screens, door panels and antenna arrays. 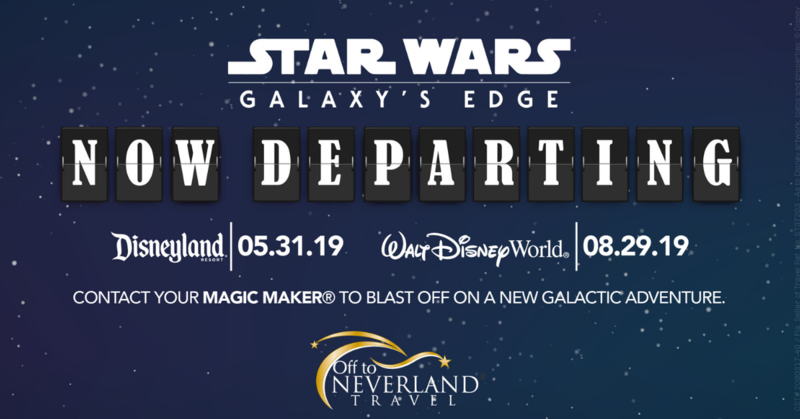 Guests planning to visit Star Wars: Galaxy’s Edge at Disneyland® Park only between May 31 and Jun. 23, 2019 will need valid theme park admission and will be required to make a no-cost reservation, subject to availability, to access the land. During this time period, there will be no stand-by admission into the land. Information on how to make a reservation will be available at a later date. For guests staying at one of the three Disneyland® Resort hotels during these dates, they will receive a designated reservation to access the land during their stay (one reservation per registered guest), but valid theme park admission is still required. Beginning Jun. 24, 2019, the separate reservation for the land will no longer be required. Star Wars: Galaxy’s Edge will be open during normal park operating hours. It will not be included in Extra Magic Hour or Magic Morning at Disneyland® Park. Disney FASTPASS service, including access via Disney MaxPass, will not initially be offered at Millennium Falcon: Smugglers Run. Disneyland® Park will continually evaluate their operations and services in order to help provide a great guest experience. Vacation packages, park tickets and Disney Resort hotel stays do not guarantee access to Star Wars: Galaxy’s Edge as the land and its experiences are subject to capacity restraints and other restrictions. Capacity for the parks, Star Wars: Galaxy’s Edge and its experiences is limited. Access to the park, land and experiences may be restricted or unavailable depending on guest demand and other factors. A reservation will not be offered/required to experience Star Wars: Galaxy’s Edge at the Walt Disney World® Resort. Valid theme park admission to Disney’s Hollywood Studios® is required to visit Star Wars: Galaxy’s Edge after its opening on Aug. 29, 2019. Capacity is limited. Star Wars: Galaxy’s Edge will be open during Extra Magic Hours. During Extra Magic Hours, guests staying at select Walt Disney World® Resort hotels can spend extra time at Disney’s Hollywood Studios® enjoying select attractions. Disney FastPass+ service will not initially be offered at Millennium Falcon: Smugglers Run. Disney’s Hollywood Studios® will continually evaluate their operations and services in order to help provide a great guest experience. Take a look at artist renderings and videos showcasing Batuu! Walt Disney World® Resort is featuring two special events giving guests breakfast and early morning access to favorite Magic Kingdom® Park and Disney’s Hollywood Studios® attractions. Enjoy a delicious breakfast featuring a continental buffet with yogurt, fruit, pastries and assorted cereal, as well as your choice of a main dish like avocado toast or fried chicken served with a tasty cronut. NOTE: The breakfast setup will be available at a select quick-service dining location outside of Toy Story Land. Contact your Magic Maker® travel professional for more details and to secure your tickets! Magic Kingdom® Park (Dec. 2, 2018 and after): Official Check-in will take place near the far left Touchpoints of the Main Entrance to Magic Kingdom park beginning at 7:30 AM. 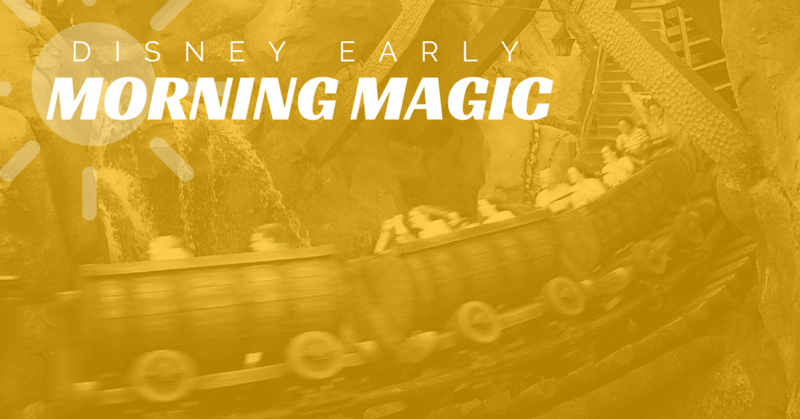 Starting at 7:45 AM, event Guests will be admitted into the park and guided into Fantasyland. Guests arriving after 7:45 AM should check in inside the park on the Teacups bridge. The Many Adventures of Winnie the Pooh, Seven Dwarfs Mine Train, Princess Fairytale Hall, “it’s a small world”, Under the Sea ~ Adventures of the Little Mermaid and Mad Tea Party are the only attractions that will be operational during this special event. From 8:00 AM to 10:00 AM, breakfast will be available at Cosmic Ray’s Starlight Café. Guests who have purchased both regular theme park admission and special event entry will receive an event wristband for identification upon check-in. Around 9:00 AM, the theme park will open to Guests with regular Magic Kingdom admission tickets and event-only attraction access will end. Please note that regular theme park admission is required for this event, in addition to Disney Early Morning Magic admission. The number of Guests admitted to these events is limited. In addition, all reservations are non-refundable, non-transferrable and are only valid for admission during the special event date and hours. All attractions, entertainment and experiences are subject to change without notice. Disney’s Hollywood Studios®: Separate Disney’s Hollywood Studios admission is required. Check-in will take place at the Main Entrance to Disney’s Hollywood Studios. Guests who have purchased both regular Disney’s Hollywood Studios admission and Disney Early Morning Magic event entry will receive a wristband for identification upon check-in. During this special event, the only attractions available will be Slinky Dog Dash, Alien Swirling Saucers and Toy Story Mania! along with opportunities to meet Buzz, Woody and Jessie. Guests must be 38” or taller to experience Slinky Dog Dash and 32” or taller to experience Alien Swirling Saucers. Guests with a 7:30 AM reservation will begin in Toy Story Land and breakfast will be available from 8:30 AM to 10:00 AM. Other reservation times may be available based on capacity. At approximately 9:00 AM, the theme park will open to Guests with regular theme park admission tickets and event-only attraction access will end. If using Walt Disney World Transportation, please confirm transportation schedules as reservation times may be outside of transportation operating hours. Please allow up to 1.5 hours to get to your destination when traveling within Walt Disney World property. The number of Guests admitted to these events is limited. In addition, all reservations are non-refundable, non-transferrable and are only valid for admission during the special event date and hours. All attractions, entertainment and experiences are subject to change without notice. 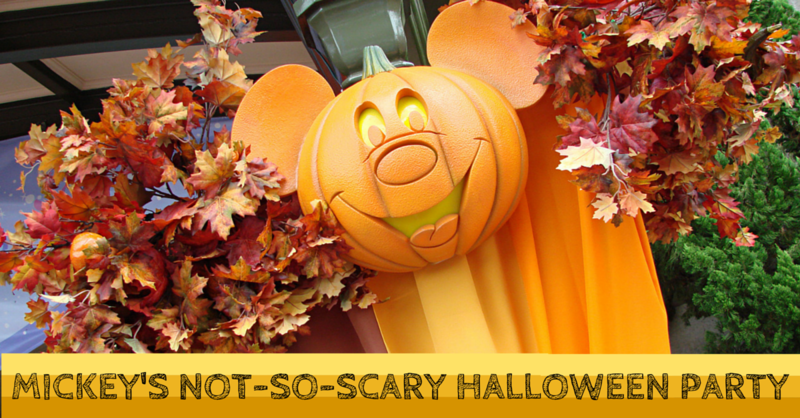 Many of us are still experiencing Winter weather, but Magic Kingdom® Park is already busy planning for this year’s Mickey’s Not-So-Scary Halloween Parties. While specific details of the specially-ticketed party has not been released, you can expect to enjoy devilish décor, delightful treats, and enchanting special entertainment. Pricing varies by date, but start at $79 in advance or $89 at the gate, if available, plus tax. Contact your Magic Maker® travel professional today to secure your tickets as some dates will sell out! Note: Disney Parks have revised their costuming guidelines for special events in their theme parks. While costumed attire may be worn, guests ages 14 and older are strongly discouraged from wearing layered costumes or costume props that surround the entire body as they may be subject to additional security screening. Additionally, costumes may not contain any weapons that resemble or could easily be mistaken for an actual weapon.